It was a humbling experience to serve as this year’s Seena Magowitz Foundation Honorary Chairman. I knew that it was going to be a big commitment but these guys are trying to cure pancreatic cancer. That’s a pretty good place to invest time don’t you think? I’m very glad I did because it has had a profound impact on me. At the Discovery Dinner Sunday evening, Dr. Von Hoff delivered a keynote address and gave us all a small glimpse of what he and his team were doing at tgen to find a path towards early detection and a way to ultimately cure the disease. Dr. Von Hoff has so many titles and awards I could write about those for pages. But it’s his heart for the people with the disease that drives his mission. He is without a doubt one of the most amazing people I have ever met and I know that his research will eventually lead to a cure, and his compassion will give some peace to those inflicted. Next came THE talk of the night from Stan Vitikas. 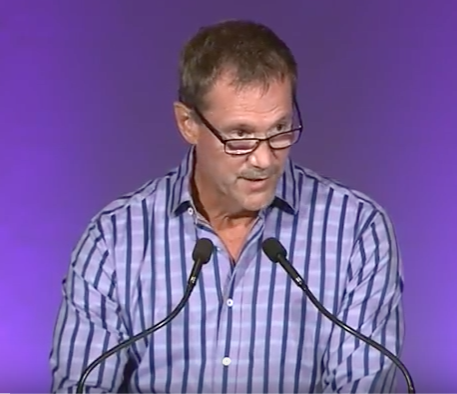 Stan has been living with pancreatic cancer for 11 years and in a very emotional speech, he shared with the audience that facing death has changed him. “Why am I alive? If not me then who?” Stan has raised over $70,000 to find a cure and his speech that night gave everyone in the room a reason to be grateful for their own life and he encouraged everyone to support Roger Magowitz and the foundation’s efforts. If you want to be inspired by Stan, give this video a look and see for yourself what real heroes look like. I was up next. Normally when I give a speech, I get a little nervous before I go on stage but over the years I have been able to manage that pretty well. This time was very different. Stan had me and everyone else in the room so choked up that I wasn’t sure I could get through what I had to say. 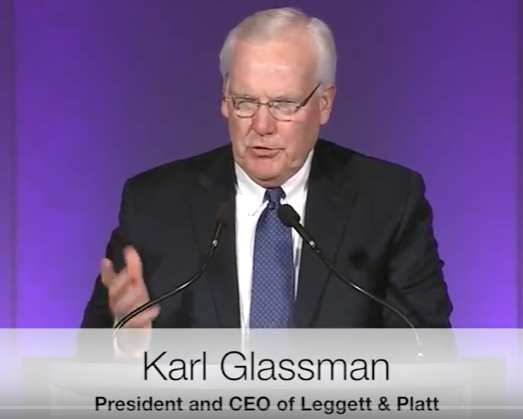 Then Karl Glassman, past Honorary Chairman of the event, current CEO of Leggett and Platt, and my friend took the stage to share a few thoughts and to introduce me. When it comes to people that I admire and respect Karl is at the top of the list for me, and for many. I didn’t get a chance that night to really communicate how I feel about him and his wife Cathi, and how grateful I was that he agreed to bring me on stage because his introduction was so incredible, I pretty much forgot everything I was going to say. Karl had recently met Senator John McCain while testifying in Washington in front of a Senate Sub-Committee. Senator McCain has been an advocate for tgen for a long time and told Karl that getting tgen to Arizona was one of his biggest accomplishments in politics. Karl was recently looking through some of Senator McCain’s writings and pulled a quote from him that he used to introduce me and after you see that, you will understand why I lost it a little at the beginning of my talk. To say that I was humbled by that is an understatement, and to say “thank you” just doesn’t do it, but….thank you. Be empathetic towards people because it will connect you to them in a very meaningful way. What if you were the one that found out you had six months to live? Would you want people to give their time and treasure? Live your life. Are you spending time on the things that matter most? If not, why not? Put your problems in check and let the people surviving pancreatic cancer serve as your inspiration. My thanks to Roger Magowitz for having faith in me to do this job and for his passion to find a cure for pancreatic cancer. I have learned a lot over the years working with Roger on this foundation and it has forever changed me! Also a big thank you to Liz McBeth event director and to Nicole Rechter who was recognized this year with an award for her work on the foundation. Also, we can’t forget all of the volunteers, you made this a huge success. To everyone that attended, you had many other places you could have been, and there are other ways to spend your money so thank you for choosing the Magowitz event. Finally, to my parents Nick and Dee Quinn for making the trip to Boston and for teaching me what it means to serve others, and to my wife Bridget for being so amazing and supporting me in everything I do, I love you all. So there is no cure YET but when it happens, there is no doubt that the mattress industry will have played a HUGE part in getting that done. Just think about that for a minute. I’m so proud to be a part of it with all of you. Watch Johnny Clegg, a world-renowned musician and pancreatic cancer survivor perform live. Opening remarks from Roger Magowitz and Derek Hall, CEO Arizona Diamondbacks. ⟵Are You Locked On Your Target?